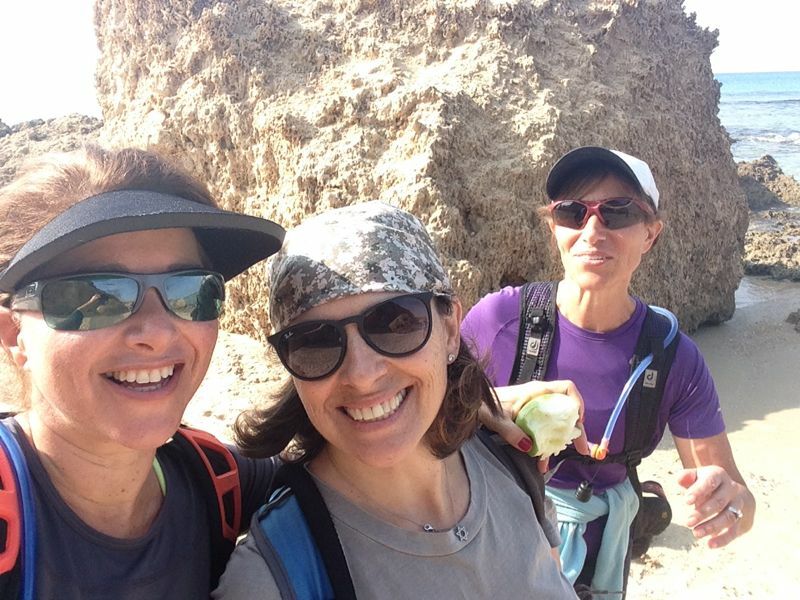 Ra’anana Hikers is growing! Today we were 11 hikers. We met around 7:30 in the morning at Poleg Beach and were off to a good start; we opened the car door and were right beside a beckoning Shvil Israel marker! Thanks to Naomi for providing many of these interesting facts abut the trail. The original Shvil path in the Sharon area was inland, at the foot of the mountains. But when Kvish 6 was paved, part of the path was destroyed, and the planners had to divert the Shvil westward to the shore. This was definitely our gain, especially on a warm and sunny November day! 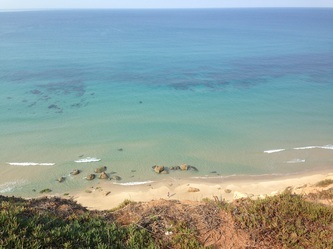 We actually imagined the trail would take us right along the beach but we started walking across dunes inland and then met up with a road that took us north into Netanya. There are still many apartments still under construction in this area, many with full views of the glistening sea. We followed the blazes along wooden boardwalks and past exercise parks and cafes down to the beach. 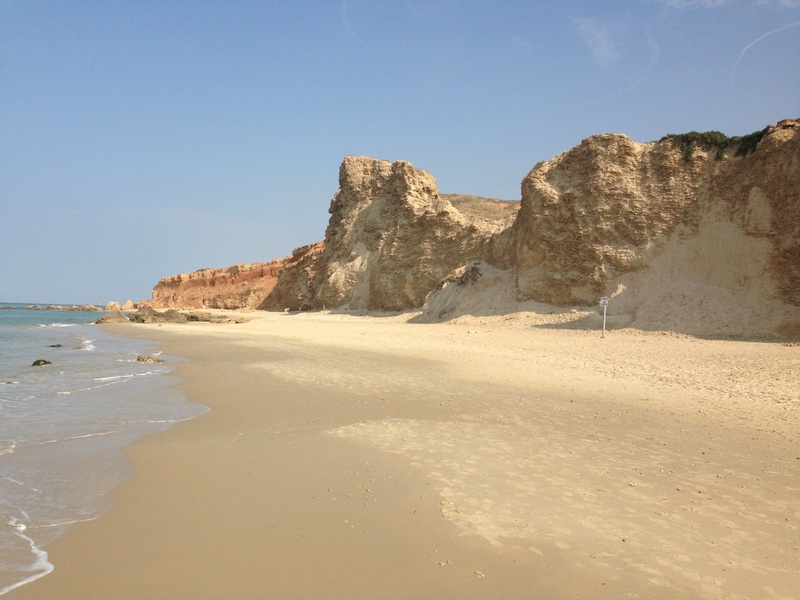 Here we landed on the sandy beach and started to walk north along the length of Netanya. Even though the hustle and bustle of the eighth largest city in Israel was just above us, we felt as if we were on a tropical vacation. It was a pleasure to see so many people at the beach in mid November. The sun was shining and the air was warm. People were in their bathing suits; some swimming, others paddling, fishing, strolling, lounging on beach towels or catching the rays. Some of us decided to take off our boots and go native, strolling barefoot across the soft sand. The trail took us past rugged cliffs and across an open expanse of glorious beach. 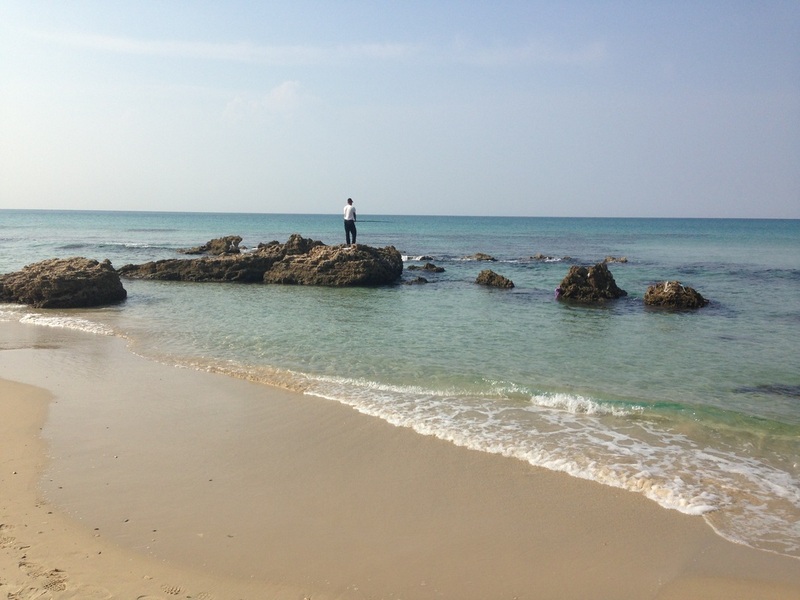 It was relaxing to walk with the rhythmic surf gently brushing the shore. 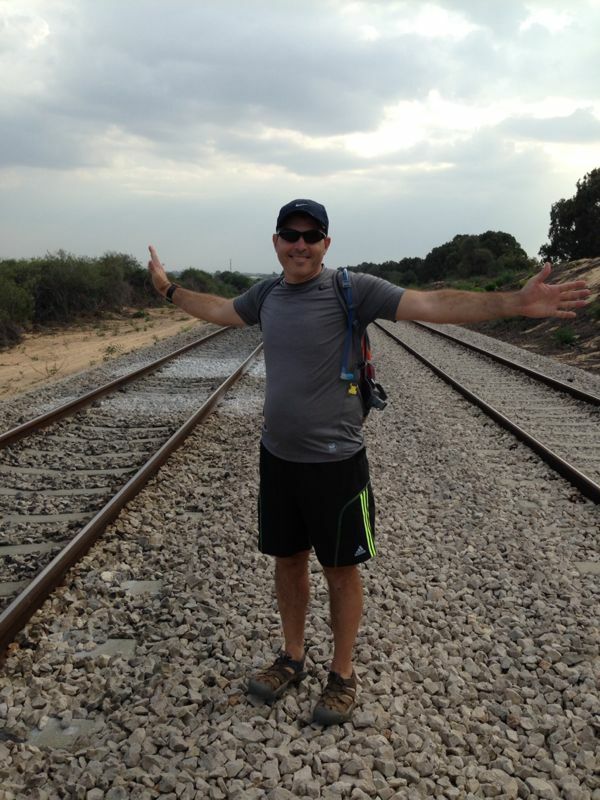 We stopped for lunch just before Nahal Alexander, where the trail turns inland. 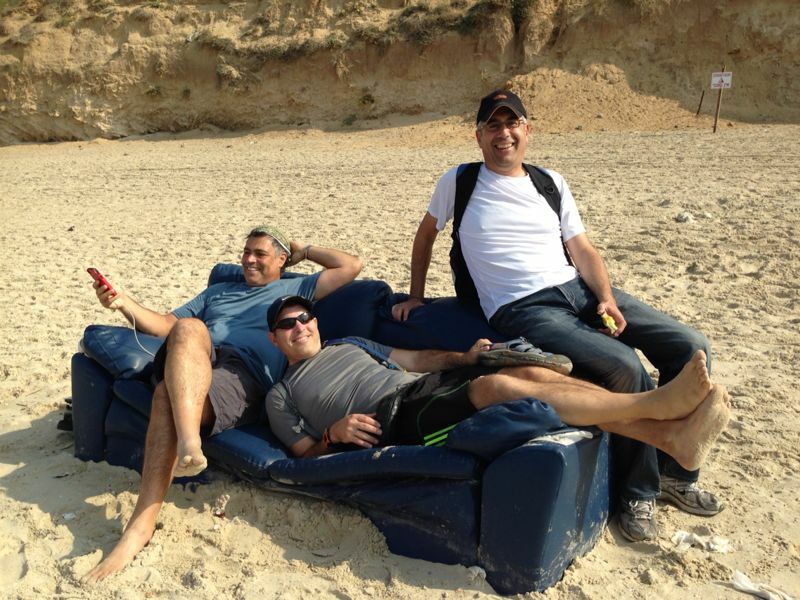 Here we found sheltered picnic tables on the beach and had a chance to relax our feet. 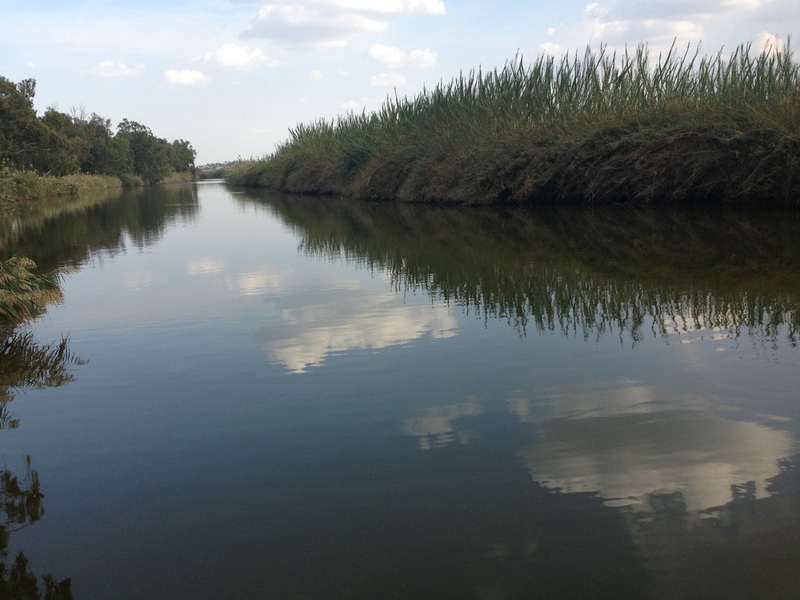 Then we walked towards Nahal Alexander and saw the spot where the river empties into the sea, marveling at witnessing the end of a river’s long journey. The blazes took us under Highway 2 and along the Alexander River. 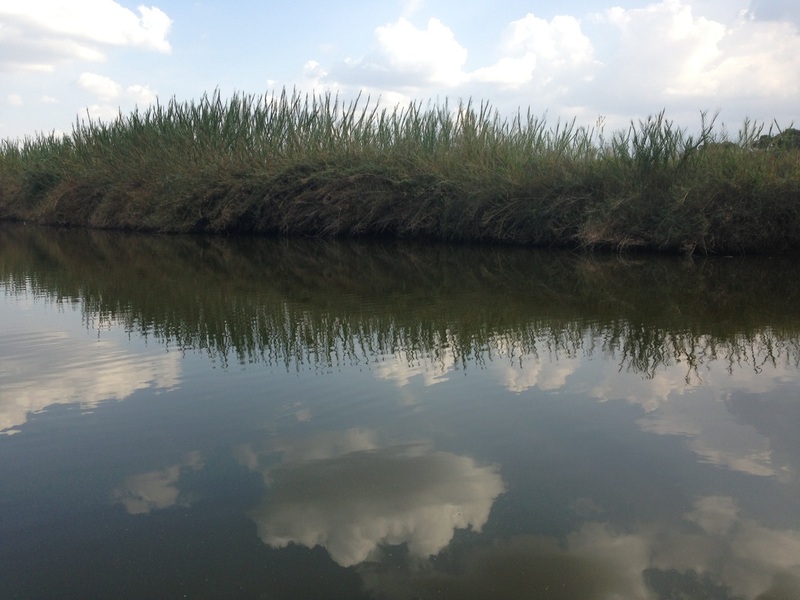 This river has undergone a clean-up program that started in 1995. Several Israeli organizations worked together on this project, and received international recognition for their rehabilitation methods. Rushes tower along the tranquil riverbank. We saw migrating birds circling above and a hungry weasel. Soft-shell turtles inhabit the river. A protected and endangered species, it is hoped that the rehabilitation of the river will help strengthen their chances of survival. The source of the river’s name is either from Alexander Yanai, the Chashmonian king who conquered the area in 100 BCE; or Wadi Acasandra named for a well-known local watermelon farmer from the 19th century with that name. He exported his watermelons to Egypt and transported them down the stream towards the Mediterranean on rafts. The neighboring Beit Yanai village is also historically named for Alexander Yanai. We left the river and walked northward beside the train tracks, passing thick groves of eucalyptus. The trail then became sandy and our tired feet feet dragged through heavy, deep sand. As soon as we spied civilization, we jumped the tracks and caught a ride back to the car. We felt tired but satisfied, covering a total of 23 kilometers in a day. We have now completed approximately 4% of the 940 km of Shvil Yisrael, but we have finsihed the greater part of the hike which passes along water paths. The Poleg stream empties out to sea just south of where we were. There are patches of deep purple iris flowers ‫ (אירוס הארגמן)which are unique to that area, that bloom in mid-February atop the Poleg sand dunes, parts of which are protected nature areas. 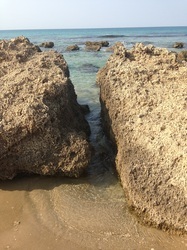 Israel has 190 km of shoreline along the Mediterranean, of which 150 km is open to the public. (40 km are ports, army installations and power stations). 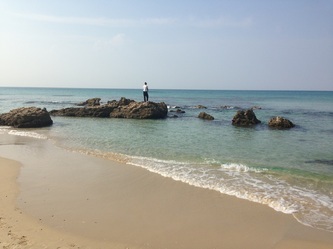 Deduct the constructed areas, and only 53 km are left as natural and open beaches. 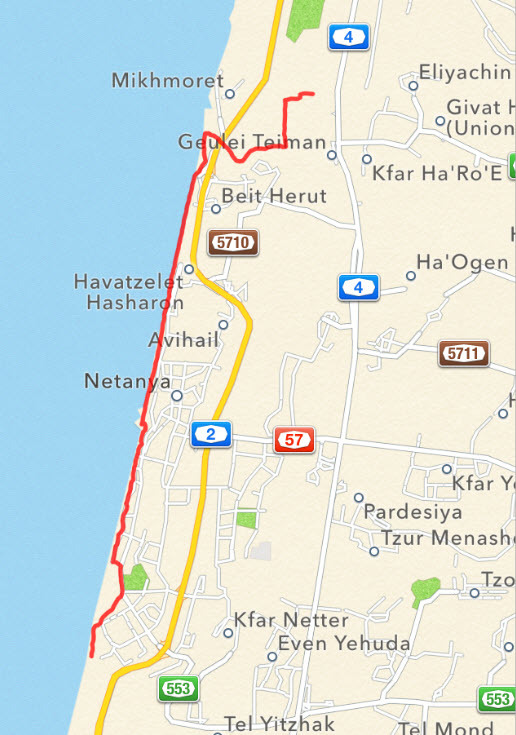 So if we hiked 10 km along the beach, that is one fifth of the entire beach line in Israel. In 1948 on average, there was 31 cm of beach space per capita. Today it is down to 2.5 cm per capita. 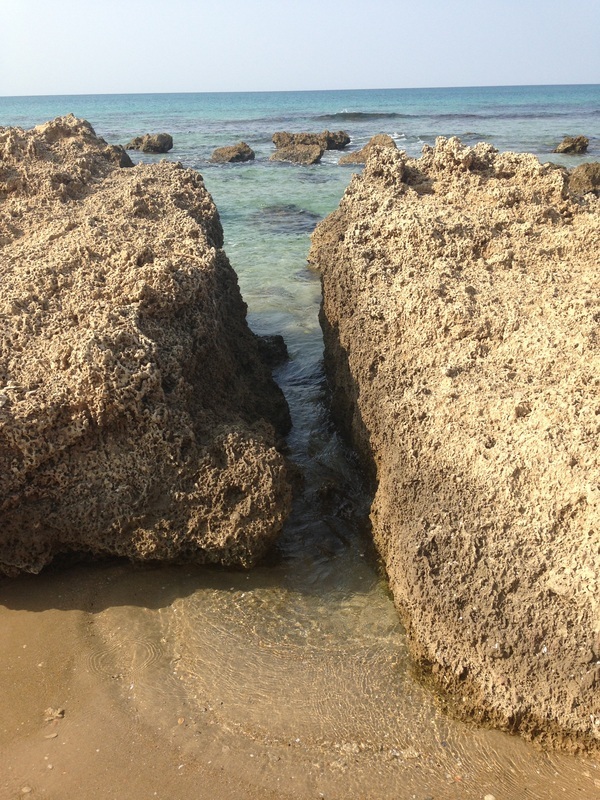 The calcareous sandstone cliffs recede 15-30 cm annually, because of wind, water, and Israeli tracteron drivers. 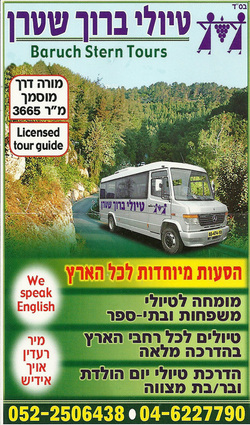 Final thought - Special thanks to our driver Baruch for getting us back to our cars.